As a former writing program administrator, I suspect that I have a somewhat different view of the so-called “Google memo,” which alleges that the powerful Mountain View software mega-company has constructed an “ideological echo chamber” that discriminates against conservative employees and requires political indoctrination by subjecting workers to training intended to combat gender bias. The memo certainly had negative consequences for the writer beyond the obvious fact that his employment with the company was terminated for violating conduct guidelines. As a public figure who had made mistakes in his previously private life, misrepresentations on his LinkedIn page were revealed, and his unprofessional conduct in graduate school was exposed. He also did not seem to achieve his stated goal of changing Google’s policies. The writer did, however, also experience some notable benefits from publishing the memo. Julian Assange offered him a position at Wikileaks after the scandal broke. New York Times commentator David Brooks called for the ouster of the memo writer’s superior, company CEO Sundar Pichai. Anonymous Internet trolls took retribution on his former adversaries, as they harassed top executives at the company, disrupted a planned gender diversity meeting, and drove the vice president tasked with workplace equity off of her Twitter account. Although the writer has distanced himself from the alt-right that has lauded his actions, his hashtag campaign #Fired4Truth has drawn over 70,000 Twitter followers, and he has been frequently invited to showcase his opinions using online chat technologies where he can control his self-presentation — starting with an interview with voluble “men’s rights” advocate Stefan Molyneux. Notable right-wing columnists have praised the memo’s prose as insightful. They have characterized its logic as well-reasoned and grounded in empirical facts. The current Wikipedia page about the controversy (currently flagged for its questionable neutrality) seems to extend the memo’s potentially misogynistic arguments about women’s biological fitness as programmers and software engineers to validate paying more attention to evolutionary gender difference as an explanation for disproportionate representation in technology fields. 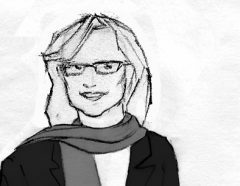 As a rhetorician, I still find myself with more questions about what its author James Damore was hoping to accomplish with the memo and how he might have applied previous advice about writing and experiences with composition to the specific situation of invention, drafting, revision, and circulation. I am treating the memo itself as a primary text, which was supposedly written in the cramped circumstances of a twelve-hour flight between the U.S. and China. Obviously the memo is structured around an assumption of strong binaries, which is a common feature in the writing of many undergraduate composition students and one tackled in our writing textbook Understanding Rhetoric — not only between masculine and feminine subject positions in Damore’s memo, but also between political right and left. 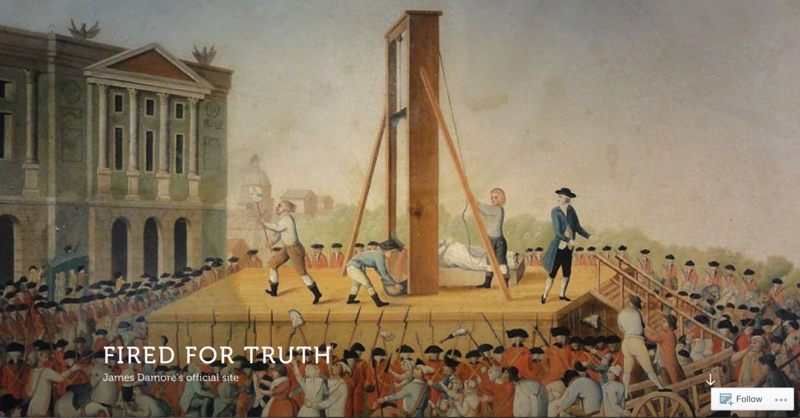 Damore’s website tied to his #Fired4Truth hashtag campaign no longer appears to be online, although readers can see its visual rhetoric of revolution and persecution below. As a graduate of the University of Illinois, Damore would have almost certainly have taken composition courses as part of completing his general education requirements, and this coursework would have been likely shaped by the work of the campus’s Center for Writing Studies. Yet I suspect that his former writing instructors would be reluctant to take credit for Damore’s post-graduation efforts at rhetoric and research. The genre of the memo is certainly problematic if it is intended to be a persuasive document. For example, in The Atlantic it was characterized by Ian Bogost as a “would-be manifesto,” a “10-page fulmination,” and an “anti-diversity screed.” In many ways, however, Bogost gives the author the benefit of the doubt by focusing on the assumption that the writer was attempting to put forward an argument with structure and support, however misguided. 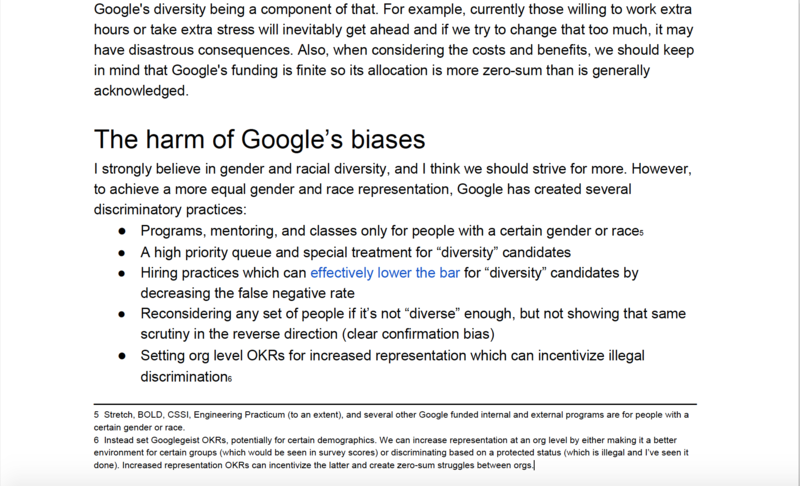 Given the context, it’s reasonable to sneer at the anonymous Googler’s simple grievances against workplace diversity. Supposedly natural differences between men and women make them suited for different kinds of work, he argues. Failure to accept this condition casts the result as inequality, he contends, and then as oppression. Seeking to correct for it amounts to discrimination. Rejecting these premises constitutes bias, or stymies open discourse. 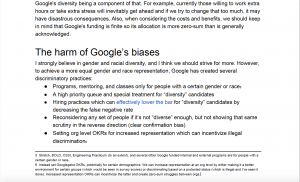 The Googler does not reject the idea of increasing diversity in some way. However, he laments what he considers discriminatory practices instituted to accomplish those goals, among them hiring methods designed to increase the diversity of candidate pools and training or mentoring efforts meant to better support underrepresented groups. What I find most interesting about the memo, as someone who has taught many novice writers, is its tendency to go off-topic, despite the supposedly disciplined outline that ostensibly organizes its claims. The writer announces that his intention is to challenge company procedures and policies, particularly Google’s anti-bias training and mentorship programs that he considers discriminatory, but he provides almost no specifics about the corporate practices with which he has first-hand experience. Using details about the training (which he was included in by force) and mentorship (which he was excluded from by force) would be relatively easy to do and more likely to appeal directly to audience members within the company. Those reading the memo could use similar experiences as a touchstone, and this approach would establish more common ground for the argument than its scattershot of links to less relevant topics. For example, video exists of a session from the company’s unconscious bias training. Is this a representative sample of the messages to which the writer objects? Commentators have justifiably accused Damore of “scientism.” Writing instructors trained in making marginal comments on student writing might be similarly likely to locate specific moments when Damore cherry picks his scientific findings to support his claims. For example, searches on the same topics within Google Scholar indicate that Damore’s sources on “microagressions” and “stereotypes” are much less likely to be cited in the peer-reviewed research of others than more authoritative articles in leading journals. In addition to using research from outliers, he also cites blog posts that are not peer-reviewed. although at least one is deceptively linked to a site for a peer-reviewed journal. His linking to the Wikipedia article on “neuroticism” to associate a pejorative mental disorder with the female gender not only relies on an online encyclopedic source that is not peer-reviewed; it also omits the fact that another mental disorder — psychoticism — shows up in one of the most cited article on gender and neuroticism as a cross-cultural trait associated with maleness. If the writer decides to disregard the context of the immediate rhetorical situation of the company and its training — and how it bears on his complaint about discrimination by gender and political affiliation — and prefers to focus on making much broader and potentially more tangential scientific generalizations about gender, it seems that he needs to do more to establish his ethos as a scientific expert. The initial pose of anonymity in a depersonalized internal document obviously makes this task more difficult. His graduate training at a prestigious program, Harvard’s Department of Systems Biology, could have enhanced his credibility as a source of expertise, but the writer chooses to make no mention of his background in science. 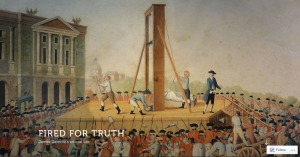 Instead writer Damore attempts to establish his ethos in a footnote at the bottom of page two, where he identifies himself as a “classical liberal” and allies his philosophical framework with the work of Jonathan Haidt. Damore cites him as an authority by linking to one of his pages, but like all scholars Haidt has his critics, notably UCSD emeritus professor Patricia Churchland, who has challenged Haidt’s innate moral foundations theory. In arguing that women might be inherently worse at software engineering than their male counterparts (as members of a population rather than discrete individuals to be fair to how he qualifies his claims), Damore obviously ignores the fact that at one time women dominated the field of computer programming, which is documented in the research of many scholars — including Nathan Ensmenger and Janet Abbate, that labor history often shows a pattern of devaluing the role of female pioneers. This history suggests that cultural exclusion may be more important factor than Damore would like to admit, which might justify Google’s belated inclusion efforts. My supposition — which I would never raise with an actual writing student for fear of quack psychologizing — is that Damore needs to believe in his inherent abilities as a programmer because he has had less professional training than many of his other Google peers. Given how programming literacy tends to have moral valences and associations with intellectual competence, as Annette Vee’s recent book on Coding Literacy points out, some defensiveness about his preparation is understandable. Much like the hero of the recent film Ex Machina (2014) who wins a coding contest at the start of the movie to achieve recognition from a Silicon Valley company, Damore describes in the Molyneux interview being spotted by Google based on his aptitude at solving programming puzzles rather than formal schooling. Giving weight to nature rather than to nurture in his own argumentative framework also buttresses his own status as someone more deserving of a place in Google than those who called for his firing.